First rule to make your New Year's Eve unforgettable: come to Genoa! The last day of 2018 will be extraordinary: "Lo Spirito di Genova - The Spirit of Genoa" is the keyword; and "Words to the city" is the big hit of the party. There is no place like Genoa to spend the last night of every year, but this time is really special: at 10pm starts the party in the heart of the city center, Piazza De Ferrari. In front of Palazzo Ducale and near to the magical atmosphere of Carlo Felice Theater, the "teacher of light" Marco Nereo Rotelli come back to Genoa for light her up like Rudolph's nose. Blue light show for Genoa, therefore, into a beautiful choreography on the wall of wonderful buildings in Piazza della Vittoria. At 10:30pm starts an unprecedented dj-set with genoeses songs and voices of cultural players: dj set is also in streaming on bertallot.com and on the app Radio Casa Bertallot. At the stroke of Midnight, let's pull the trigger! Dj-set dance with Alessio Bertallot makes the whole city dance. The access is free and open to all. Genoa thanks Comune di Genova and Regione Liguria, and sponsors MSC and Intesa San Paolo. There are a lot of other proposals in Genoa for New Year's Eve: in the glittering atmosphere of its historic center, between the lighted party squares, with the promise of unforgettable fun between the Old Port and the Aquarium, and the beauty of Rolli Palaces Unesco World Heritage Site. The Museums of Strada Nuova will exceptionally open their doors on New Year's Eve, for a special New Year full of art art and culture in the sumptuous setting of the marvellous historical houses. The night starts at 6pm with aperitif and background music. At 10:30pm the Radio Gaga get on the stage with a concert full of energy: they'll sing all the most popular Queen's songs until the toast of midnight. Then, concert go on with cover of Queen and live music 80/90s and the immortal dance successes. Event by Civ Genovino. Toast at midnight and gallery open until 2:00am to visit the magnificent Paganini Rockstar exhibition. At the Old Port of Genoa, as usual, meeting with the magic atmosphere of circus as part of the Circumnavigando Festival. An evening full of entertainment and fun for everybody, for every age along with the Circus Zoé: born to be circus, in Piazzale Mandraccio from 9:30pm to 1:30am. The last night of 2018 you can spend amid the fun of the Ferris wheel, the joy of the skating rink from 10pm to 5am, special events with games and science and technology laboratories in the city of children and young people, with the show of Prof. Pietrosky from 21pm to 1:00am. The Genoa Aquarium renews the suggestive and exclusive appointment to celebrate the New Year's Eve immersed in the magic of the seabed, with a special free visit to the itinerary, exhibition, cocktails, Gran Gala Dinner and midnight toast. It is necessary to book, subject to availability, by contacting C-Way tel. 010 2345666; email info@c-way.it. On the occasion of the event, on 31 December the Aquarium will anticipate the closure at 2.00 pm (last entry 12.00). For those who choose a toast at the theater, there are several proposals of the city's theaters: the National Theater stages at Duse Poker, by Patrick Marber and at the Court Colpi di Timone by Vincenzo La Rosa and Gilberto Govi; the Teatro della Tosse staged La Prima Luna, by Emanuele Conte, a theater and song show suitable for an audience of all ages; at the Teatro Politeama Genovese, as tradition of the last years, New Year with Maurizio Lastrico; at the Teatro Govi Zelig vs Colorado, with Daniele Raco and Gianpiero Perone. 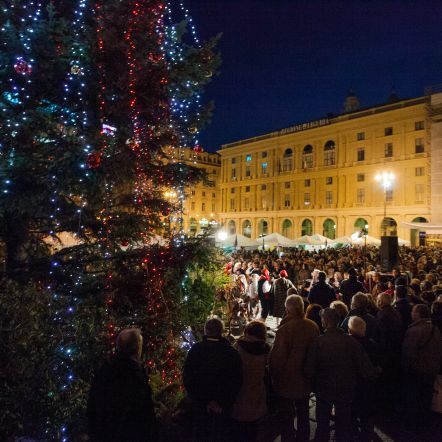 Winter park of Genoa organized a special night for New Year's Eve. With 180 attractions, fun is assured. At midnight there will be celebratory toast. At Palazzo della Meridiana, celebrations for the New Year start at 8:30pm with guided tour of Sala del Colonnato. Then Cocktail in Sala Calvi and New Year's Dinner in Salone Cambiaso. Midnight toast in Sala Camino and open bar, with dj set for dance until 2am! Info and prices: tel. 010 2541996 ; email eventi@palazzodellameridiana.it. Villa Durazzo Pallavicini organizes the evocative Esoteric New Year, with guided tour, dinner in the castle and celebrations for the arrival of the new year in the Marquis's initiation caves. Reservations must be done by December 10th contacting info@villadurazzopallavicini.it or by phone the number 010-8531544.